Joy Birch of Highview Residences in Kitchener offers advice on how to plan ahead for celebrating the holidays when you have a loved one with dementia. Number one: be nimble in planning, as busy events can be overwhelming. It's a good idea to plan out holiday visits with a loved one who has dementia to make sure it's not an overwhelming experience for them, says Joy Birch, the chief operating officer at Highview Residences in Kitchener. The holidays can be overwhelming for anyone, but a person with dementia can feel it much more — and for days and weeks after a hectic get together with family, says Joy Birch. Birch is the chief operating officer at Highview Residences in Kitchener, a care home for people with dementia. "The holidays are a time when there tends to be a lot of people around, we have a lot more activities happening, we definitely have a lot more fancy lights and it just tends to be a time when there are greater expectations on everyone, but particularly on that person who has dementia," she told CBC Kitchener-Waterloo during the annual Sounds of the Season fundraising broadcast. Birch recommends people start planning early to have the best holiday experience for everyone and offered some suggestions on what people need to keep in mind. She suggests family members get together and talk about what they want to do over the holidays. "And then put a filter on it and say, OK, does our person who has dementia, do they have to attend every one of those single things or is it possible that we could look doing things a little bit differently." Birch says smaller personal interactions are better for people with dementia, so one big family gathering might not be a good plan. You may also want to consider whether the family gathering is even the best place for the person with dementia. She says some people will question: 'how could we not include Grandpa?' And there's often some guilt associated with that. "It's best to look at what's best for Grandpa," she said, despite what the group itself might want. "Be nimble," she said, noting while you may have a game plan for the day in your mind, you should know it may not play out that way. When having someone with dementia to your home for a meal, try simple things to help them such as wearing name tags or place cards in front of plates. The person may start telling a story. Birch says if they do, run with it even if you know it's not true. "Never, ever say, 'don't you remember...' and never, ever say anything that's going to [contradict] the story that they're telling you." Bright lights and holiday music can be sensory overload for a person with dementia, Birch says. She suggests turning off some of the lights and turning down the music. Also, Birch advises you to consider any decorations that could be trip hazards and reposition them. This will make it safer for the person with dementia to move around. If the person with dementia can't leave their care home, Birch suggests family should do multiple smaller visits rather than go as a large group. She said family members should plan to spread out the visits and talk to caregivers at the home about the best time. She finds visiting before 2 or 3 p.m. is best because of "sundowning" later in the day, which is when people with dementia tend to get more confused and agitated. If you want to do a meal with the person with dementia, she suggests planning for lunch or a mid-morning coffee and treats. People want to buy something special for their loved ones. Interactive books and games are a good suggestion, as are puzzles. "They absolutely love the really old classic movies and the really old classic sitcoms," Birch said, adding I Love Lucy is regularly on TVs at the care home. Music is another unifier, she says. "They can sing songs that they haven't heard for 30 years, so music is a lovely idea," she said. There are also handmade items called fiddle muffs, which are cuffs a person can wear that have little pieces on them like buttons, ribbons and beads. "We have a resident who talks loudly and repetitively, but once she puts the hand muff on she becomes very calm," McPhee said. After a long day of celebrating, everyone feels exhausted. But Birch says for people with dementia, it takes more than a good night of sleep to move beyond that overwhelming feeling. 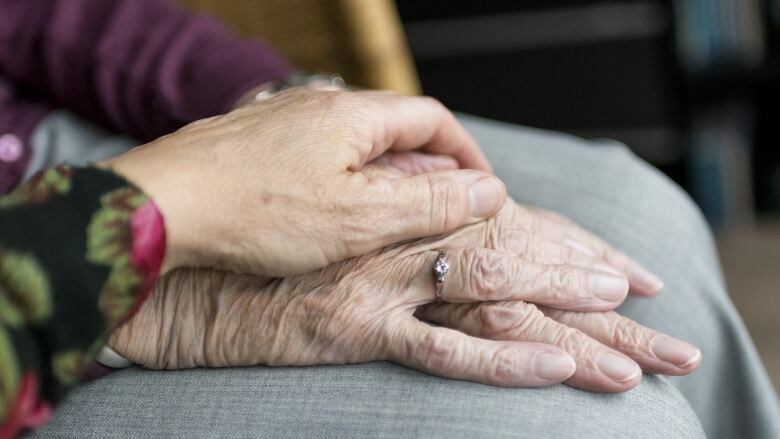 She says when people return to the care home after a stimulating event, it will take them longer to settle at night, they may not sleep through the night and they may feel anxious. If you're tired after the holidays, "take that with a person with dementia and multiply it exponentially." "When they come back from a really stimulating event … There's a really good chance that the coming home can be tough." Visiting a person with dementia can be a difficult experience for some people, but Birch says it's important to remember the person will benefit from it. "Even if the brain cannot understand the reason why things are happening, the body still has the same reaction to it. And so when you smile warmly and lovingly at them, when you speak slowly, when you don't correct them, when you give them a snug or a hug, they can still react and they absolutely know in their body — even if their mind can't connect it — that it's a beautiful, warm moment," she said. "They just want to be with you," she added. "There are times when they don't want to be with you and that's time for you to go home. And that's OK, too."